Gum disease is a major risk factor for the development of serious health conditions, including heart disease and diabetes; therefore keep gum problems at bay by choosing the best toothbrushes for gum diseases by NeoB Co. Ltd. This specially designed brush allows you to clean below the gum-line, where the bacteria that cause gum disease are found and where other brushes, interdentals and floss can’t reach. Keeping these awkward areas free from bacteria will get rid of all your symptoms such as inflammation, soreness and bleeding gums. It is a simple but effective tool. By using this special toothbrush just for 5 minutes a day, you can easily get rid of gum problems and enjoy a healthy, trouble free smile. 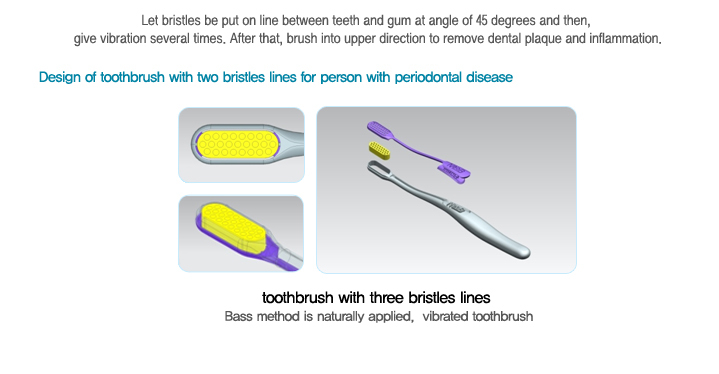 The bristles are super-soft and designed to be as gentle as possible on the gums affected with gum disease. They may deform slightly with use, but can easily be straightened with clean fingertips. NeoB Co. Ltd is a leading manufacturer in Korea dedicated to helping customers maintain a beautiful and healthy smile. Contact Us for more details about our patented products.